Your kitchen can bloom year 'round with beautiful flowers or lush plants. 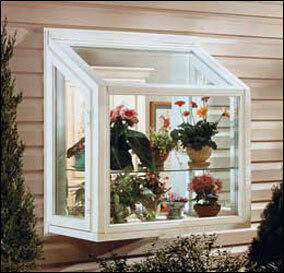 UniFrame's garden window adds sunlight and warmth. You'll grow to love your garden window more each year. Learn more with a free estimate today! Tempered glass interior shelf adds space for plants (standard on units under 50" wide -- units over 50" wide include a coated wire shelf). Available in white, camel or earthtone to complement your home. Optional DuPont Corian® seat adds durability. Operating trapezoid casement side panels feature easy-to-operate, easy-to-reach, multi-point locking system. Optional polyurethane insulated seat adds energy efficiency. This option is strongly recommended. Extra-thick uiPVC vinyl is completely maintenance free. Extra thick uiPVC has color that's solid throughout...no painting or scraping -- ever. Optional Easy Clean Glass needs cleaning half as often -- with half the effort of ordinary window glass. Stainless steel hinges will never rust, so they'll always look new. Fusion-welded strength for added durability.